I having been training in the marital arts for 31 years, primarily in Kyokushin Karate and Iaijutsu (Shin Shin Ryu). I have branched out into a number of styles/school in the last 31 years of Budo. I am student of both Soke Newton James (of the Fighting Black Kings Fame) and Shihan Larry Swanser. Our goal at Kaizen Kan is to pass on the wisdom that was past on to us, to the next generation, to see the arts live and breath as they help improve the human qualities. These arts belong to everyone. I am a Shihan of the Bas-I Kyokushin Karate Organization and serve as the Arizona Branch Chief. Professionally I have served our nation as a member of the U.S. Army (MOS 11B1P) and am a Federal Law Enforcement Agent . Sensei Tom has been training in Kyokushin Karate for over 42 years along with Filipino Bando and Aiki-Jujitsu. He is a direct Student of Shoshu Shigero Oyama, Shihan Richard Ganon and Soke Newton James. He holds a 4th Dan in Kyokushin Karate. He is a veteran of the U.S Navy and the Volvo Corporation. He is married with 4 children. Sensei Scott is an instructor and has 20 years experience teaching and training in Kyokushin Karate (4th Dan). Sensei is the lead instructor of our kids program (Ages 5-7) , where he takes a unique approach in grooming the next generation of Kyokushin Karateka and preparing them for their future. he is a firm be leaver in quality of quantity. Sensei Scott is a career law enforcement professional and father. Sensei Joe is a 4th Dan with over 30 years experience training and teaching Kyokushin Karate. He is a ret. Command Sargent Major in the U.S. Army Infantry (MOS 11B1P). I am Sensei ( Lar) Swanser. I came to begin a 35+ year journey on the path of Sosei Oyama inOctober 1979. After much discussion I and my wife were the first students in the Seattle dojo were we learned. Although we wore Seido patches on our gis we were trained in strict Oyama karate. Our Sensei had actually trained in the Tokyo Honbu on two occasions. Although we were technically Seido under Kaicho Tadashi Nakamura we remained an island of Kyokushin Kai. My best synopsis of our training is shortly viewed by watching the documentary "Fighting Black Kings"circa 1975-76. After nearly 35 years I left my Dojo and moved to Florida. 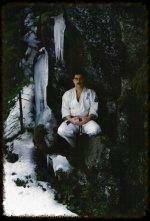 Shihan William Schrader became my kohai at age 11 years and trained with me for some 17 years. His passion and prowess was unbelievable ! I am very proud to have elevated him both 2nd and 3rd Dan. As his physical dynamics soften his wisdom replaced it. He is a very complete martial leader. I am proud to have trained with him. We are of a past generation and hope to carry the standards forward. Today's students are tomorrow's leaders.